SecureCRT is definitely worth your while. Compared to similar products, it’s very comfortable to work with, it features extensive protocol support, it encrypts the data using a wide array of ciphers (AES, Twofish, Blowfish, 3DES and RC4) and it allows you to use WSH scripting engines in order to automate tasks. 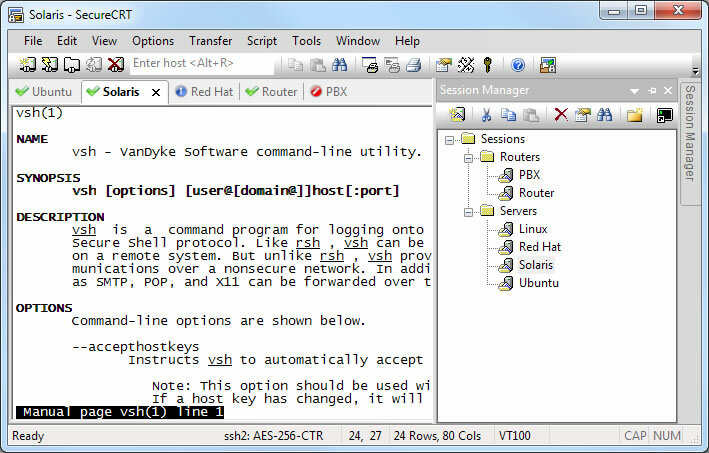 SecureCRT is a GUI-based SSH / Telnet client and a terminal emulator that features support for a wide array of protocols such as SSH, TAPI, serial and rlogin. Its list of capabilities includes secure transfers, highly configurable sessions and SSH encryption, to name the most important ones. SecureCRT features the most accessible user interface that we’ve seen in a terminal emulator, allowing you to create and customize up to five thousand tabbed sessions. In addition, the application facilitates encrypted logons and provides flexible authentication options. File transfers can be achieved via the integration with SecureFX. The sessions can be shared between these two applications, thus enabling the possibility to run FTP, SFTP and SCP transfers without the need to re-enter passwords. SecureCRT 8.0 improves productivity with an updated UI and enhanced smart card (PIV/CAC) support. On Windows, tab groups allow you to compare the output of two sessions, group related sessions, and switch easily between them. On all platforms, you can apply colors to button bar icons for easy-to-see visual cues. TN3270 emulation support expands the range of systems you can use with SecureCRT. Other improvements include Command window "Send characters immediately" mode, host key fall back, and new TFTP server connection options. Whether you are looking for a Telnet replacement with solid security and session management or a more refined and capable remote access tool to help raise your productivity to the nth degree, SecureCRT is an application you can live in all day long. foreground, and ANSI color combinations. text in the terminal area is rewrapped. making it easier to find and connect to saved sessions. buffer contents into a production or other critical server. database is large or located on a network drive. included on the recent session list. option to specify the script path has also been added. and install the new version. launched when a tunnel is established.